Out of the Past (1947) is one of the 1001 classic movies you should see. 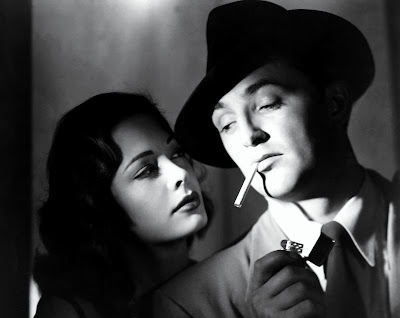 It stars Jane Greer as a femme fatale and Robert Mitchum as the private eye turned gas station owner who loves her. Each week, I'm going to recommend a classic movie you should see (for the reasons behind the 1001 series and reviews of earlier films covered go here). This month I'm celebrating Robert Mitchum's centenary -- the iconic actor was born Aug. 6, 1917, in Bridgeport, Conn. -- by looking at four of his films. This week's selection is the seminal film noir Out of the Past (1947). Out of the Past tells the story of Jeff Bailey (Mitchum), a gas station attendant in the small-town of Bridgeport, Calif., who is harboring a big secret. As it turns out, Jeff is a former private eye on the run from crime boss Whit Sterling (Kirk Douglas) because he once had a love affair with Whit's girl, Kathie (Jane Greer). To make things right between them, Whit summons Jeff to his Lake Tahoe hideaway for one last job: stealing incriminating tax documents from Whit's lawyer (Ken Niles). Out of the Past is based on the novel Build My Gallows High by writer Geoffrey Homes that set off a bidding war between Warner Bros. and RKO Pictures, who were, at the time, old Hollywood's leading purveyors of the noir genre. Homes badly wanted Humphrey Bogart to play the role of Jeff, but Warner's, who had the popular noir actor under contract, refused to loan his services to RKO, so the film went ahead with RKO contract player Mitchum at the helm and the veteran horror-movie team of director Jacques Tourneur and cinematographer Nicholas Musuraca behind the camera. The result was a modest hit that has since come to be regarded by movie critics as the quintessential film noir. Out of the Past made Mitchum, who was then a moderately successful RKO contract player, a major star. He plays the fedora and trench-coat clad Jeff very much in the model of Bogart anti-heroes like Sam Spade in The Maltese Falcon (1941), but with a key difference. Mitchum's low-key demeanor -- his slow drawling speaking voice is very different than Bogie's clipped New York accent -- and casual masculinity made him a new kind of movie hero. In fact, Jeff's self-imposed isolation and his catchphrase, "Baby, I don't care,"capture much of the angst-ridden ennui of the Postwar period in American life. 1. Location shooting. Noir thrived in the mean streets of urban America, and while there are plenty of dimly lit alleyways in Out of the Past, the film is one of the few noirs that actually takes place at least partially in rural America. Tourneur and Musuraca use the stunning vistas of Lake Tahoe and the Sierra Nevadas to their best advantage in a series of outdoor set pieces. 2. Cigarette smoking. The great critic Roger Ebert rightly pointed out that Out of the Past had the most cigarette smoking of any movie ever made. The characters puff away in almost every scene -- Mitchum fishes with a cigarette hanging out of his mouth -- and Musuraca creates stunning shots of the smoke curling over their heads. 3. Douglas. Out of the Past was also a breakthrough for Douglas. His memorably devious performance as Whit -- he's like a more charming Michael Corleone -- led to larger roles in noirs like Champion (1949) and The Detective Story (1951). 4. Greer's role. Out of the Past features one of the most cold-hearted femmes fatales in movie history, and Greer's portrayal of Kathie as a murderous man-eater marks a decided shift in the treatment of women in old Hollywood films. The era of the great female stars like Bette Davis and Joan Crawford was slowly fading away in exchange for sexpot and "the woman as villain" roles. 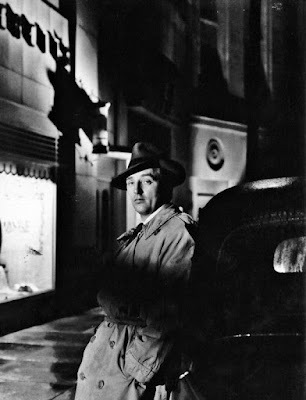 Robert Mitchum as private eye Jeff Markham in Out of the Past (1947). Other critics: Out of the Past has a 97 percent fresh rating on Rotten Tomatoes and Leonard Maltin writes that the film is a "classic examples of 1940s film noir with dialogue a particular standout" in a 3.5 star review for his Classic Movie Guide. Critics in 1947 praised the movie. Variety liked the "[d]irection by Jacques Tourneur [which] pays close attention to mood development, achieving realistic flavor that is further emphasized by real life settings and topnotch lensing by Nicholas Musuraca." The usually unimpressed Bosley Crowther of The New York Times was particularly taken with Mitchum. He wrote that the actor "is magnificently cheeky and self-assured as the tangled 'private eye,' consuming an astronomical number of cigarettes in displaying his nonchalance." The Bottom Line: Out of the Past isn't my favorite noir -- that category is filled by The Big Sleep (1946) -- but it is still essential viewing for anyone who wants to take a walk on old Hollywood's dark side. 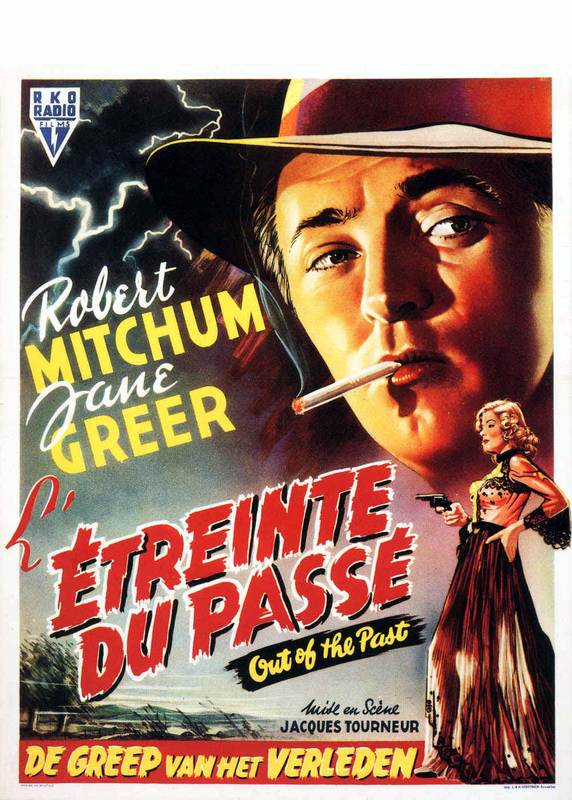 Watch it for Tourneur and Musuraca's masterful cinematography, the crackling dialogue, and Mitchum's iconic performance as the ultimate noir anti-hero. Availability: Out of the Past will air at 10 p.m. Aug. 6 on TCM. It is also available on DVD and video on demand. Next week, I'll cover Mitchum as a World War II soldier who meets up with nun Deborah Kerr in Heaven Knows, Mr. Allison (1957).